366 pages | 30 B/W Illus. Commercial air transport is a global multimillion dollar industry that underpins the world economy and facilitates the movement of over 3 billion passengers and 50 million tonnes of air freight worldwide each year. 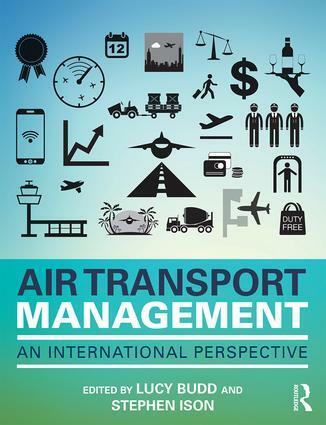 With a clearly structured topic-based approach, this textbook presents readers with the key issues in air transport management, including: aviation law and regulation, economics, finance, airport and airline management, environmental considerations, human resource management and marketing. The book comprises carefully selected contributions from leading aviation scholars and industry professionals worldwide. To help students in their studies the book includes case studies, examples, learning objectives, keyword definitions and ‘stop and think’ boxes to prompt reflection and to aid understanding. Air Transport Management provides in-depth instruction for undergraduate and postgraduate students studying aviation and business management-related degrees. It also offers support to industry practitioners seeking to expand their knowledge base. Lucy Budd is Senior Lecturer in Air Transport and Programme Director of the MSc in Air Transport Management in the School of Civil and Building Engineering at Loughborough University, UK. Dr Budd has extensive experience of teaching air transport at both undergraduate and postgraduate level and she has published widely in the area of air transport operations and aviation management. Stephen Ison is Professor of Transport Policy and Programme Director of the BSc degrees in Air Transport Management and Transport and Business Management in the School of Civil and Building Engineering at Loughborough University, UK. Professor Ison has taught transport economics and policy for 30 years and has written and edited nine books in the areas of aviation, business and economics.